From setting the agenda to collaborating on the presentation, make sure you’re prepared before you present with this all hands meeting template. Break your meeting out into key themes. Make sure your meeting has a clear agenda by breaking it up into categories such as results and strategies, highlights from the past quarter, project updates, or new initiatives. Also leave room to celebrate achievements. Appoint a moderator and speaker for each theme. Then, let them know what they’re responsible for and how much time they have to speak in advance of the meeting. Set a timeline for your meeting prep. You’ve got your meeting on the books, but do you also have a due date for setting the agenda? Or wrapping up slides? Make sure everyone involved in planning knows what prep work they’re responsible for and by when. Share your agenda and ask for Q&A questions in advance. Before your meeting, share an overview of your agenda, and ask your employees to submit questions. That way, you’ll all enter the meeting with a shared understanding of what you should get out of it. After you’ve developed a template for planning all company meetings, re-use it every time to get the process set up quickly, and ensure nothing falls through the cracks. Go even further by setting it up in Asana, and make your meeting planning a collaborative effort. Clarity around purpose, plan, and responsibility help you hit goals. Try out our framework. How do you turn your high-level objectives into reality? Try these six tips. Go beyond listing company goals and objectives and learn how to track progress towards them. 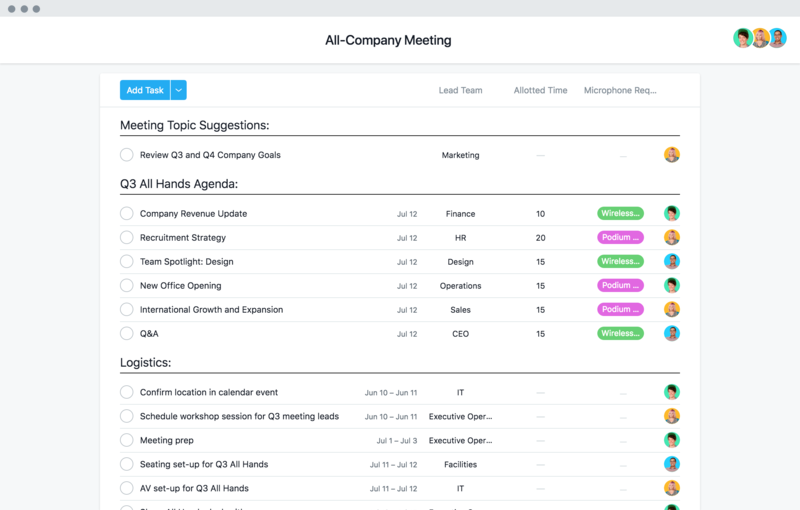 Manage your all company meeting in Asana and help your organization plan their best work yet with a free trial of Premium.